The .NET Framework considers a dictionary to be a collection of KeyValuePair objects. In thinking of this collection as a dictionary, there are two conflicting concepts: On one hand, we want each pair to consist of a key and its value (with duplicate keys allowed), but on the other, we want each pair to consist of a key and a collection of the values corresponding to that key. Since we will exploit some aspects of each, we will adopt both concepts. This will enable us to treat our collection as both a collection of keys and as a dictionary in the second capacity mentioned above (i.e. each pair represents a key and its values). This will enable us to treat our class as a collection of values, irrespective of their keys. This will enable us to treat our collection as a dictionary in the first capacity mentioned above (i.e. each pair represents a value and its key). Note that in implementing all 3 of these interfaces, some methods and properties will have conflicting signatures. Where the behaviour of the conflicting members is identical, we will provide a public implementation. Where the behaviour of the conflicting members is intrinsically different (or if unapplicable to the collection’s ultimate use), we will provide an explicit implementation, which will be hidden from the end-user unless the class is used exclusively in the capacity of the owning interface. If both members should legitimately be public-facing, we can create aliases (such as KeyCount to resolve the ambiguity with Count for the values). 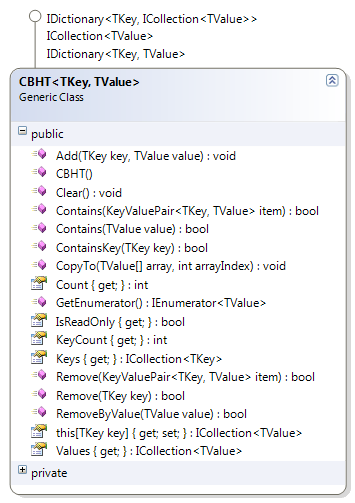 Using this member variable, we can wrap the existing functionality for determining the existence and number of keys, accessing the key elements (as a Dictionary<TKey, TValue>.KeyCollection) and some principal operations such as Clear(), Remove(). Perhaps most importantly, we can wrap the ready-made indexer to retrieve the linked list of values, given a key. The implementation uses no other instance variables; all other functionality is achieved by manipulating the inner collection ad-hoc.